Press E to display the Inventory screen. Click a square containing wood blocks to pick them up, and then click an empty square in the crafting grid to place them there. Four wooden planks appear next to the grid. Click the square that contains the planks. 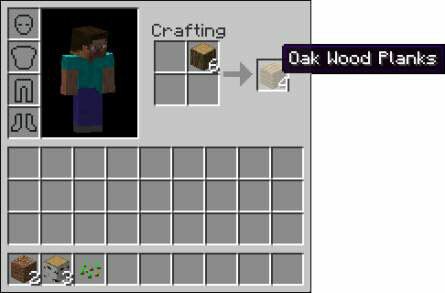 One wood block disappears, but four wooden planks appear on the mouse cursor! Click the square that contains the planks a few more times to pick up all the planks you can, or Shift-click to send all planks directly to the inventory. You can use these planks as building blocks or to build a crafting table and chest. Press E to open the Inventory screen. Click a square containing your planks, and then right-click each square in the crafting grid to distribute four planks into the squares. 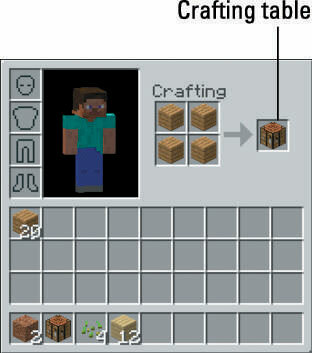 A crafting table appears on the right, as shown. Click the crafting table to pick it up, and then click a square in the bottom row of the inventory to place the table there. You can access items outside the Inventory screen only if they’re on the bottom row. This row is always displayed at the bottom of the game screen. Press E or Esc to close the inventory. Use the 1–9 keys or the scroll wheel to select the crafting table. A thick, white outline appears around the crafting table. You can use either the number keys or the scroll wheel to select items from the bottom row of the inventory. Place the most useful items in the slots you can quickly access. Right-click a nearby surface to place the crafting table there. Right-click the crafting table to view a screen similar to the inventory, with an expanded crafting grid. You use this grid for all crafting recipes in the game, including the chest.